Hello! As we inch closer and closer to the winter holidays, I get more and more excited. There are so many great DIY’s and recipes to try out! 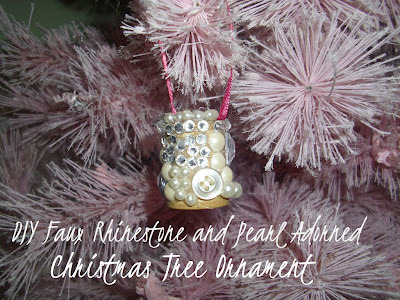 Today, I am going to show you how to make your own rhinestone and pearl adorned ornaments. These environmentally friendly ornaments would serve as the perfect gift for a friend or as a lovely way to decorate your Christmas tree. They are relatively easy to make so who knows, you may end up making them for all of your friends! Supplies: Faux rhinestones and pearls, ribbon, scissors, hot glue gun, hot glue and a used spool with no thread left on it. Cost: If you use ribbon and a spool that you already have, you would just have to purchase faux rhinestones and pearls (and possibly a hot glue gun/hot glue) which would bring the total cost to between $5-$12. You can also use buttons. I used supplies that I already had at my house- an old spool, rhinestones left over from a previous DIY, pearls from a broken necklace, my mom’s hot glue gun and ribbon left over from a different DIY. Level of difficulty: Very easy. No sewing involved. You just have to be able to work with a hot glue gun. This DIY should take less than 30 minutes to complete (not counting step 1). 2. Plug in hot glue gun. 3. Decide how you want to arrange the rhinestones and pearls on the spool. They should cover practically the whole spool. They don’t have to cover the bottom. However, you can cover the bottom if you find that more aesthetically pleasing. Either way, your ornament will look great! 4. Cut out a short piece of ribbon (2-4 inches). 5. Glue both ends of the ribbon to the top of the spool. Make sure that it is well secured. You may want to glue some extra ribbon on top of the ribbon that you originally glued down depending on how heavy the rhinestones, pearls and spool you are using are. 6. Start decorating the spool with rhinestones and pearls. 7. Voila! You have a brand new ornament that can either adorn your Christmas tree or be a cute gift for a friend. So what do you think? Will you be trying this DIY out this season? saving this post. definitely have to try making this ornament for my tree! We, it's so pretty, you're so creative :) thanks for the comment sweetie!